Amara made the Principal’s Honor Roll again this trimester. 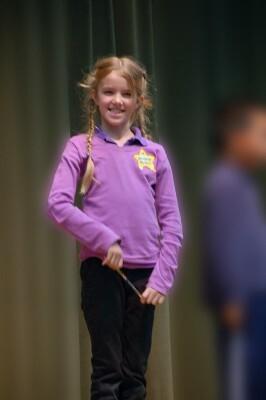 She made it the first trimester of second grade and we are hoping to have a repeat of the three-peat we had last year. She is such a good student. They had the awards ceremony last week and unfortunately we couldn’t be there this time. But Jenna took lots of wonderful pictures and video for us. I love the digital age, video is the next best thing to being there. This memory was posted in Special Occasions and tagged Amara, honor roll, school on May 7, 2012 by Grandma Kc. Amara does read the comments so I know she will appreciate the good wishes. As for the braids, Jenna has been having a blast watching YouTube videos on how to do all kinds of different braids! I want her to try some of them on me! We are so lucky to have such a wonderful grandchild and the parents who raised her that way. Congratulations to Amara! Best wishes for another three-peat! Yes, indeed, a fantastic student. Parents and grandparents have much to boast about and be proud of! Smart and cute? Wow! Congrats Amara! I loved braiding my daughters hair all different. Amara looks quite thrilled. Love that joy! Congrats to Amara! Uncle Mark and I are so proud of you!! Well isn’t that something? Congrats Amara, we are all proud of you.